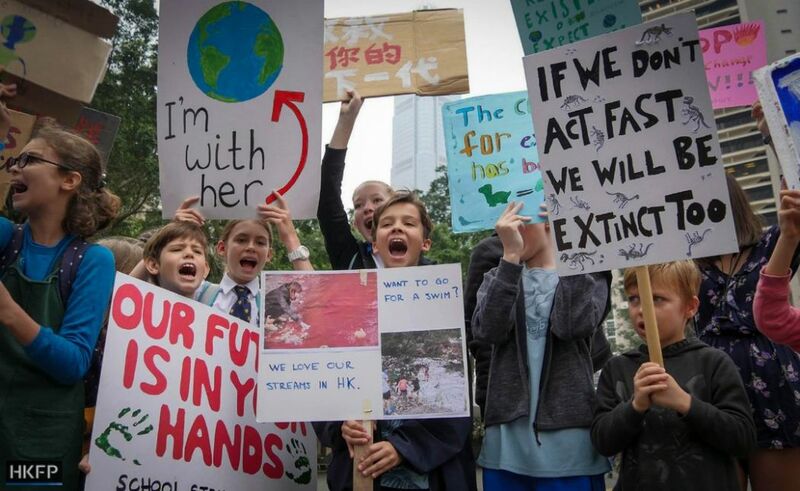 Hundreds of young environmentalists skipped school on Friday to urge Hong Kong authorities to take stronger action over climate change. 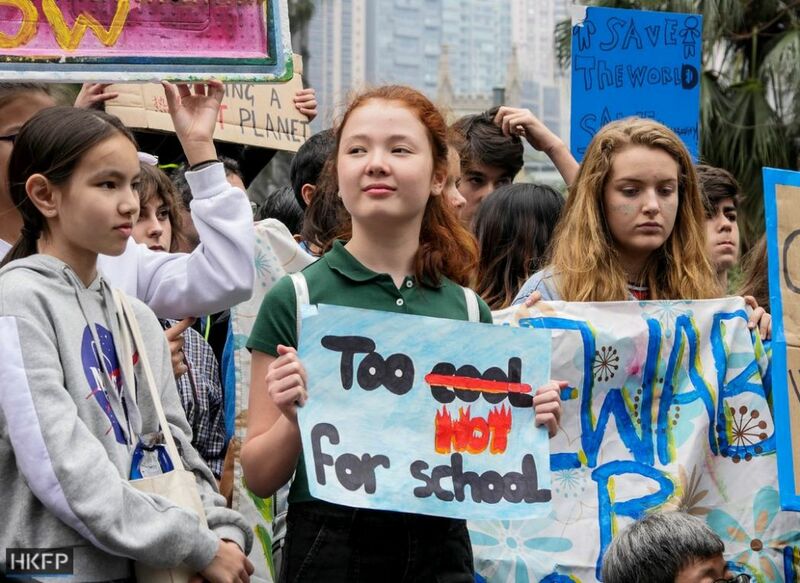 The rally was part of an international day of protest inspired by 16-year-old Swedish activist Greta Thunberg who staged a school strike outside the parliament in Stockholm last August over climate change. She has since been nominated for a Nobel Peace Prize. 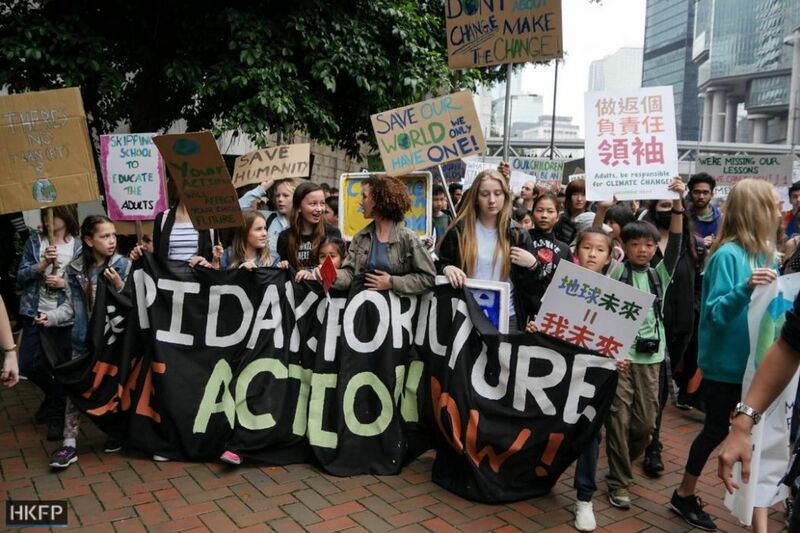 Similar protests under the hashtags #FridaysForFuture and #SchoolStrike4Climate were also held in over 100 countries including the cities of Shanghai, Hangzhou, Guangzhou, Shenzhen, Chaoyang, Taipei, and Taoyuan City. 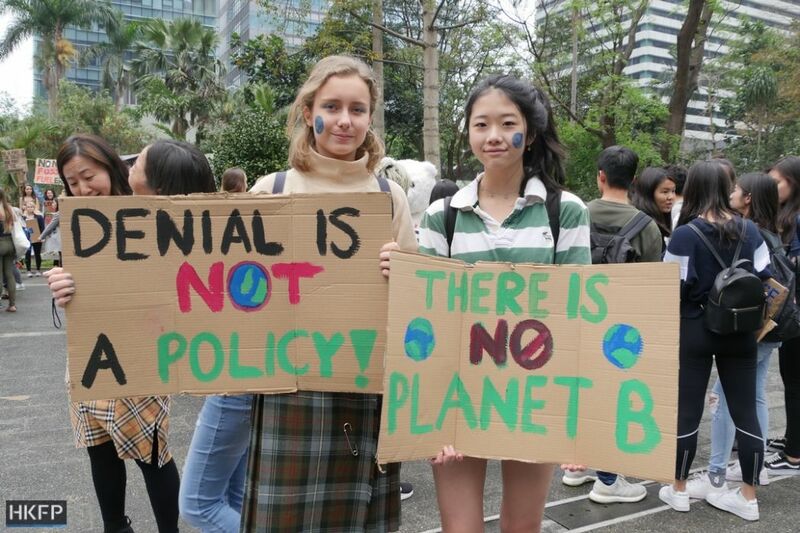 In a statement published on Wednesday, student organisers asked the government to establish youth representatives in the Steering Committee on Climate Change, an interdepartmental environmental action group, as well as create a dedicated “Climate Action Officer,” and commit to increasing the city’s reliance on renewable energy to more than three or four per cent, as outlined in Hong Kong’s Climate Action Plan 2030+. 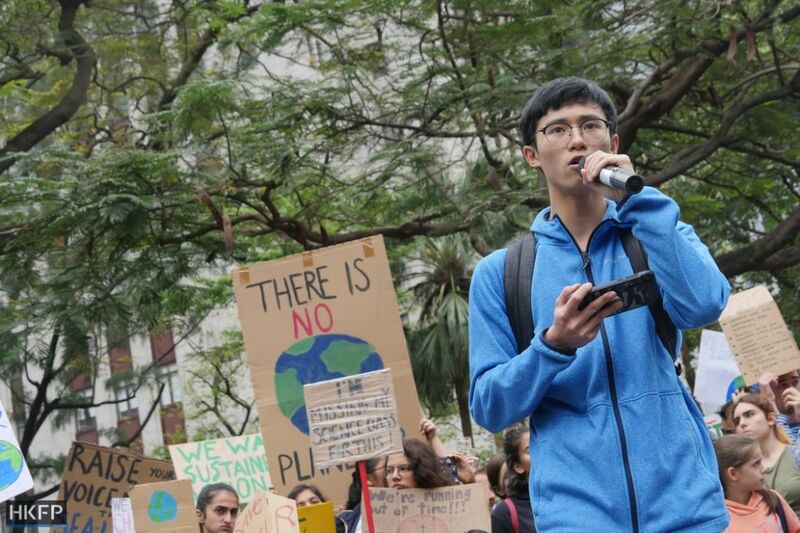 Seventeen-year-old Haruka Cheung, who co-organised the event, told HKFP that student delegates are essential to represent the views of those who are too young to vote yet. Haruka Cheung (centre). Photo: Jennifer Creery/HKFP. She added that representatives should be elected each term to ensure the role is not disruptive to their studies. 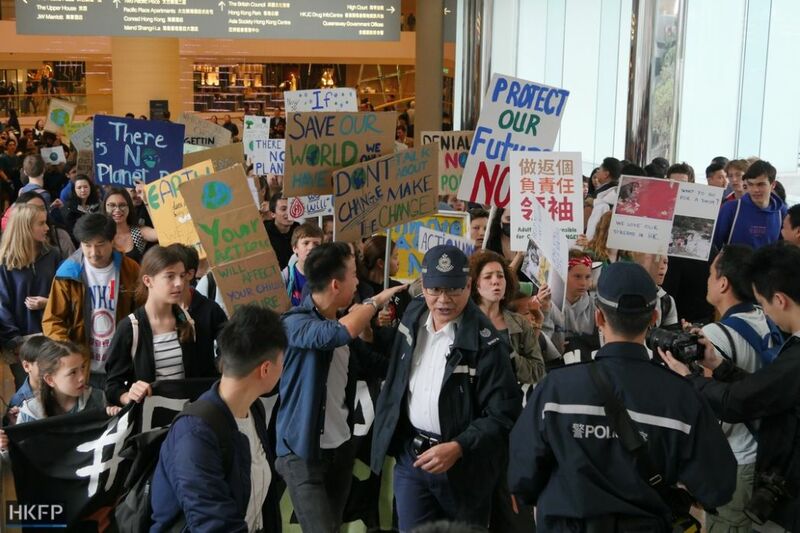 Christina Sternby, 16, told HKFP that students had to miss school in order to get the attention of authorities. Christina Sternby (left) and Kylie Chong (right). Photo: Jennifer Creery/HKFP. 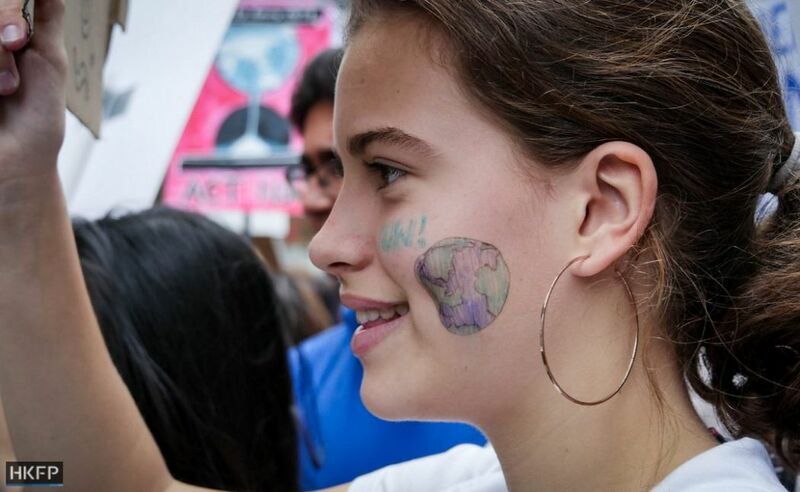 Amandine Fischer, 17, told HKFP that despite opposition from her school administration her teachers are supportive of the march. “They actually encouraged us to go even if they’re not allowed to tell us that,” she said. Amandine Fischer (left). Photo: Jennifer Creery/HKFP. 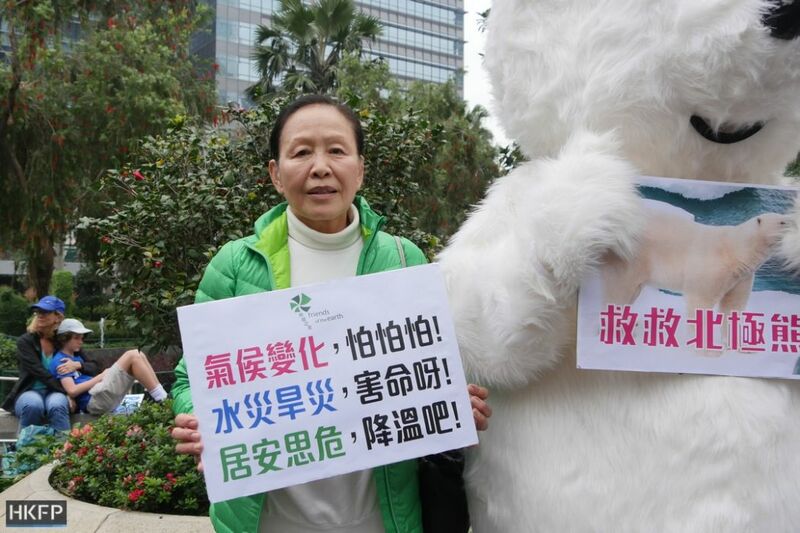 The march was attended by several environmental NGOs as a show of support. 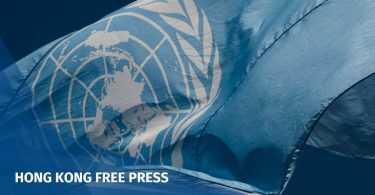 Ng added that Friends of the Earth is pushing local authorities to reduce carbon emissions by 80 per cent in 30 years and increase the city’s renewable energy usage by 10 per cent in 10 years. 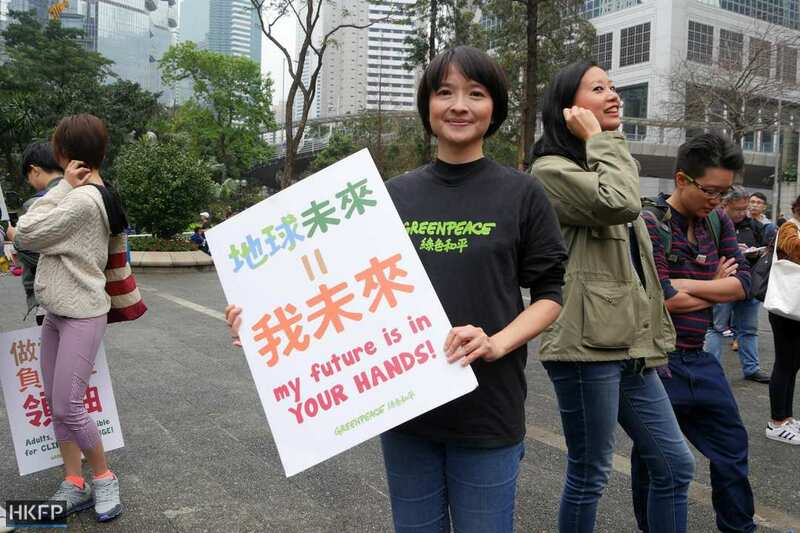 Mei Ng, chairperson of Friends of the Earth Hong Kong. Photo: Jennifer Creery/HKFP. 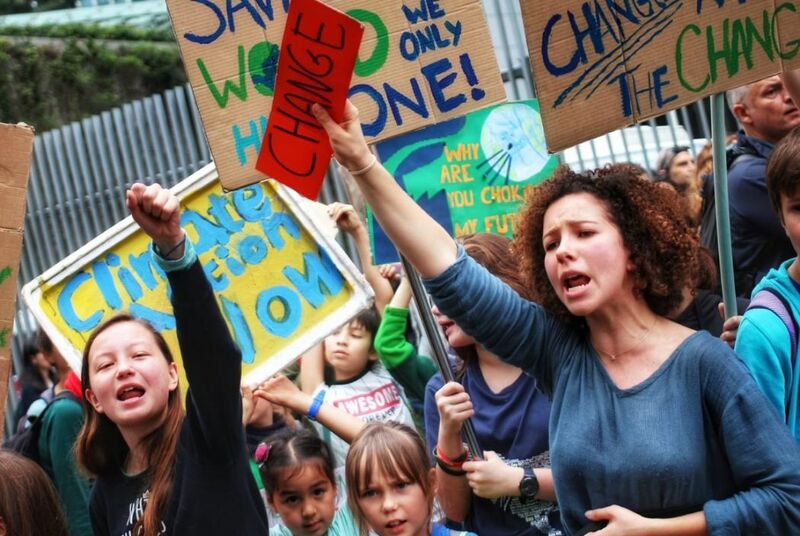 “I remember this saying, ‘we did not inherit the earth, we are borrowing it from our children.’ It’s for our children, we need to do something before it’s too late,” Ng added. Frances Yeung, senior campaigner for Greenpeace. Photo: Jennifer Creery/HKFP. 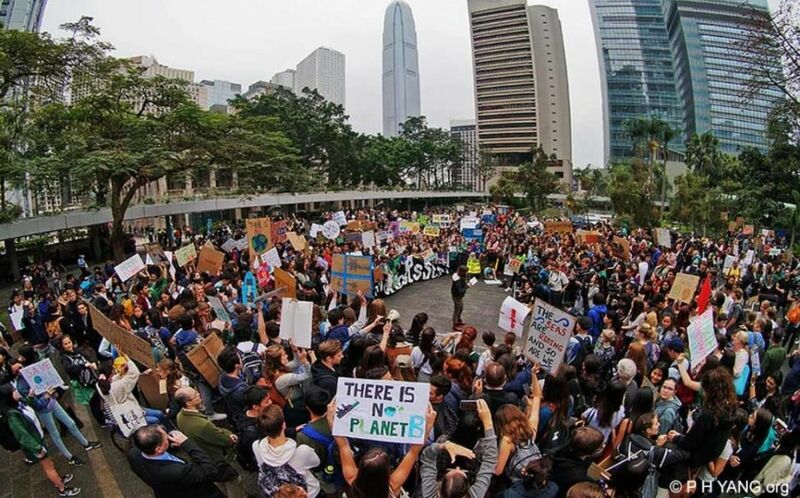 Organisers said around 800-1,000 protesters took part. 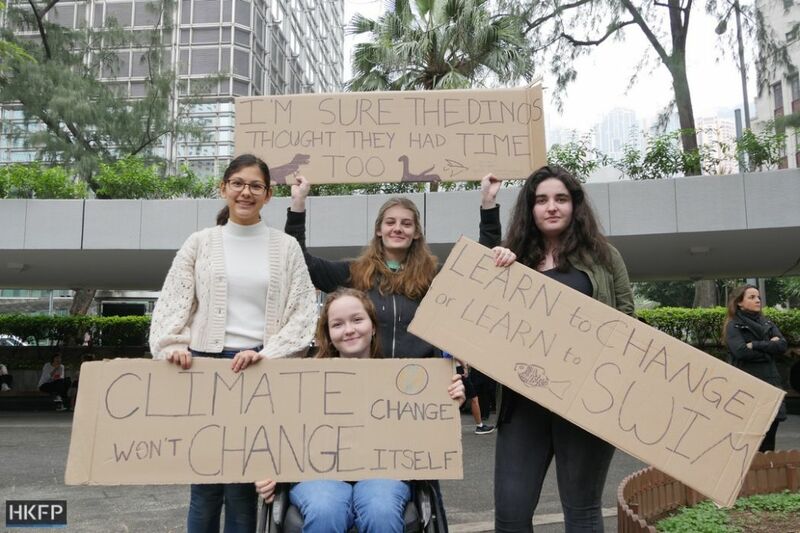 Activists and students – mostly from international and English Schools Foundation (ESF) schools – arrived at government headquarters at lunchtime to present a letter to the authorities. 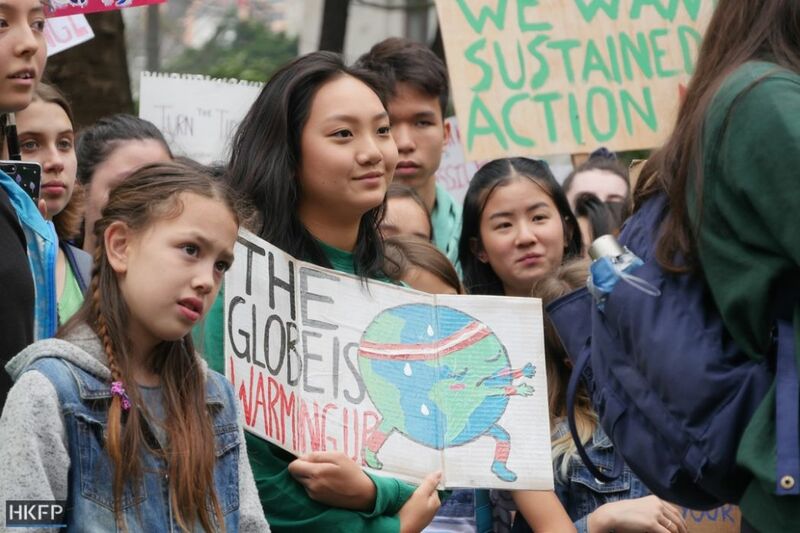 A spokesperson for ESF told HKFP that although they support the principle of the action, they cannot consent to it: “ESF students – at all levels – are encouraged to understand, analyse and tackle issues that affect their school, their community and their planet. 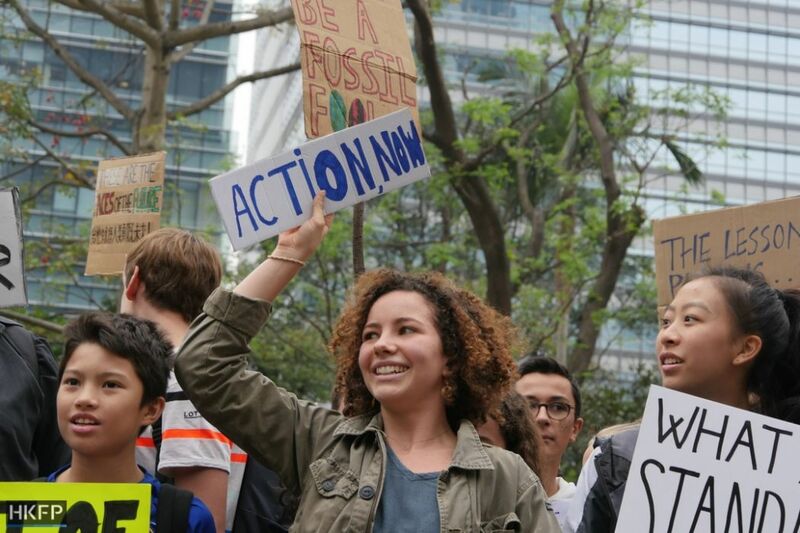 While we support, in principle, any student who wishes to make a stand about climate change, we have to concern ourselves with our practical responsibility to keep safe the young men and women who have been entrusted into our care. We would not be meeting that responsibility if we allowed students to skip school to attend any unsupervised event,” they said. 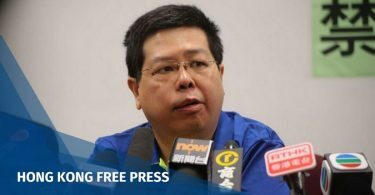 HKFP has contacted the government for comment.